I'm not quite sure what I've created here. A homemade Cadbury Creme Egg in a mini cup, yes. But beyond that, this sickly sweet creation makes a seasonal dessert attainable all year round - and I'm not sure how to feel about having that access. Is it sacrilegious? Is it messing with perfection? I don't know, but it's hard not to like it when it feels so good. (And yeah, those of us in the know are well aware that the precious creme eggs can be found year-round in dubious corner stores, as long as you don't mind questionable food safety practices or best before dates). Either way, this recipe for mock creme eggs is as close to the real thing I've found so far. I much prefer the store-bought version, but this one definitely does the trick, too. And they look so cute! Melt the chocolate either on the top of a double boiler, or on half power in the microwave. Gently scoop a small spoonful into the bottom of a mini muffin liner, and use the spoon to scrape it up onto the edges, giving the sides and bottom a generous coating. Repeat for all the muffin holes. Put in the fridge to firm up while you make the filling. In the bowl of a stand mixer, combine the honey and butter and beat until well combined and glossy. Add the icing sugar and beat until a proper icing forms. At this point, you have the option of watering down the icing to form a more goopy centre. If this is what you want (it's what I wanted), add the water and beat until well incorporated. Add more water, one teaspoon at a time, until the desired consistency is reached. Take the chocolate cups out of the fridge, and spoon 1-2 teaspoons of the icing on top. There should be a small amount of icing remaining, which you will now dye yellow by adding one drop of food colouring and mixing until the appropriate colour is formed. 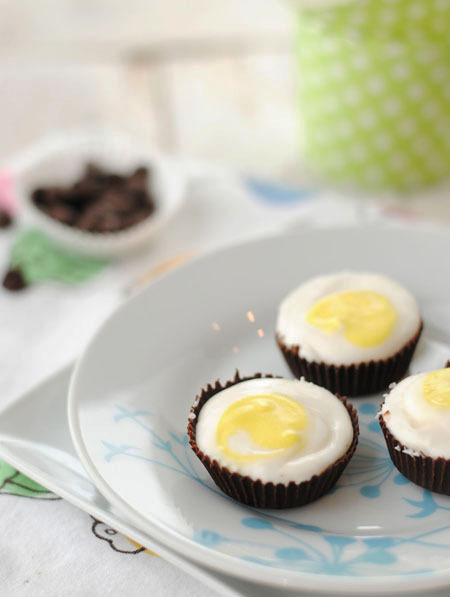 Using a spoon, or pastry bag with a small icing tip, add a dollop of yellow icing to the creme egg cups. You're done! Now either store in the fridge or freezer until ready to serve. They'll warm up very quickly, so don't worry about them being hard rocks when you take them out.